JT 105 Alliance is seeking to raise $20,000 to fund its lawsuit against the proposed 105-acre, 248-unit Alta Mira gated housing project. Over $2,000 has been raised already. You can also send a check to: “Janet Johnston” or “Gayle Austin” PO BOX 2022, Joshua Tree, CA 92252, if you would like the full amount to go to the cause. (Gofundme takes 8%.) Include your email so they can contact you. Email jt105alliance@gmail.com if you have any questions. The Altamira gated development, proposed in the heart of Joshua Tree community of Friendly Hills, will blade 105 acres of native Joshua tree woodland, shoehorn 248 speculative (and relatively expensive) homes onto 10,000 sq.ft. lots, and then encircle and enclose its maze of cul-de-sacs with wall and fence. This design is completely out of character with the area. The existing rural neighborhood is currently built on 18,000 to 2.5 acre lots, all built as needed by locals, on open, natural desert streets, through which all neighbors and animals are welcome to travel. The San Bernardino County Planning Staff said this project would have no potential impact on the environment, and pushed through a Mitigated Negative Declaration, rather than requiring an Environmental Impact Report which would have revealed the obvious issues, and would have required an alternate design. The County did not review the project for consistency with either the County General Plan, or the Joshua Tree Community Plan, which is a required “finding” by both State and County Law. The Planning Commission passed the project (4 to 1) in April, the JT 105 Alliance (an association of concerned community members) appealed, and then after a very questionable hearing, the Board of Supervisors passed the project 3 to 2, on September 27, 2016. The JT 105 Alliance filed a CEQA (California Environmental Quality Act) lawsuit, and we now need our extended community, and desert-loving guests to help pay for the lawyer, filing fees, and costs associated with this action. The core JT 105 Alliance members have spent, and will spend, hundreds of hours of volunteer time, as they see the importance of stopping this project for future of our Morongo Basin, and for the benefit of all our National Park Visitors. A controversial housing development in Joshua Tree, the 248 units on 105 gated acres known as Alta mira, got a green light at yesterday’s meeting of the Board of Supervisors in San Bernardino. The 3-2 vote in favor of the project, and against the appeal concluded almost a decade of back and forth over development of the pristine desert between Highway 62 and Friendly Hills Elementary School. As expected, Board Chair James Ramos and Supervisor Robert Lovingood voted in favor of the appeal. With no discussion or comment, Supervisor Josie Gonzales voted for the development along with Janice Rutherford and Curt Hagman. Plans call for the gated community to be built in phases with final build out ten years away. Opponents of the project have objected to its high density and other elements which do not conform to the Joshua Tree Community Plan. 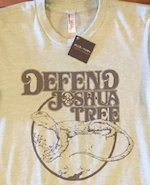 [Defend Joshua Tree] has offered to hand out Defend Joshua Tree shirts tomorrow for anyone heading to San Bernardino for the Altamira Hearing. Meet at Myrtle the Turtle (where the Farmer’s Market area is) for our carpool/caravan meeting spot at 7:45am. Drive off at 8:00. Meeting starts at 10:00. You will have to pass thru a metal detector, so leave all guns and knives at home (or at least in the car). It takes about 1 1/2 hours with good traffic. Directions: Take 62 to 10, head west towards San Bernardino. Stay to the right when the highway splits, go past Redlands, and past Loma Linda and take the Waterman exit on the right side. Go to the middle lane, turn left at the light onto Hospitality for just a few seconds, then turn right onto Waterman and drive for maybe 10 (?) minutes. Pass Rialto, and then turn left onto 4th street. Go about two blocks and you turn left into the big parking lot (FREE). The Government center is the big rose building (5 stories) with a central vault. Walk towards it, and around construction fence, to normal path into it. Bathroom is just to the left when you enter. Conference room is just up and to the left. Thanks!!! This is a summary of what happened during the Altamira Housing Project agenda Item at the San Bernardino County Supervisors Meeting of September 13, 2016. Agenda item #102 included a public hearing to consider the appeal by JT105 Alliance, and the staff had recommended that the Supervisors deny the appeal and go forward with the project. Acting as representative for the JT105 Alliance appeal, Pat Flanagan made a very detailed, specific, and comprehensive statement of all the myriad problems with the project. Then the Project Applicant made their case. Public Comment was then opened, where about 30 people (most at the videoconference room in Joshua Tree, and several in San Bernardino) made statements opposing the project. Among the topics addressed were traffic safety, fire safety, native plant removal and other environmental issues, the presence of tortoises, water issues, historical (and questionable) up-zoning of the project property, and the incongruence of such a high density project in Joshua Tree. Repeated many times was the concern that the project plan never mentioned the Joshua Tree Community Plan, and that state law requires that it be considered for such a project. In fact, according to both state and county law the Community Plan became part of the General Plan when adopted in 2007. At that time, according to the General Plan, the zoning should have been returned to its original density and it was not. Both the project applicant and JT 105 Alliance’s representative were given one more 5-minute comment opportunity. So the issue will be taken up again at the next Supervisors’ meeting on September 27. It has been a very frustrating week and a half trying to sort out what actually happened on Sept 13th, and what we can do. They definitely achieved their goal of scuppering the vote, and are clearly laying every obstacle they can in our path. THIS IS IT, if we stop them here, we most likely avoid years more of effort, and a lot of money in court. There [will be] no public testimony, it was just posted on the BOS site, with the agenda. BUT, we DO need to show them we mean business, and the main way to do that is to physically be in San Bernardino and to flood their inboxes with emails. The hearing was continued to this coming Tuesday, Sept 27, at 10am. It is unclear if they need all 5 Supervisors there, or not, to proceed. It sounds like they decided not to bother preparing the negative findings. That was their excuse for scuppering the vote, that there had to be negative findings, and there was dialogue telling Planner Terri Rahahl to write them. Apparently, once we were out of earshot, they stopped that. What IS clear is that we need a PRESENCE at the meeting, WAY preferably at San Bernardino, itself. They “acknowledge” that there are people at the Joshua Tree site, but ‘out of sight, out of mind’, unfortunately. If we are all together, at San Bernardino, they WILL SEE US. If you can only go to JT, then please do. I had conversations with another community with similar battle history, and they WON against two developments, based on their community plan, purely because people showed up all wearing the same color. That is just the reality of the situation. SO PLEASE COME OUT on Tuesday. I can’t emphasize it enough. LETTERS: WE NEED TO FLOOD THEIR INBOXES! This time please send them to the Supervisors, and to the Clerk. PLEASE make sure that your letter is in their inbox by first thing MONDAY morning. If you already wrote one for last time, please resend (with any additions you like) to the Supervisors. Make it VERY clear that you are against the proposed Altamira project in Joshua Tree at the top. It is a bit confusing: For the appeal/Against the project. Thanks!!! The State Supreme Court will decide sometime in the next 60 days whether it will accept the case. JOSHUA TREE — The Joshua Tree Downtown Business Alliance announced Monday it will try to take its battle against Dollar General to the California state Supreme Court. The Fourth Appellate District ruled in June that the Alliance did not provide enough information for a fair argument to consider the negative economic impact of the store, proposed at Twentynine Palms Highway and Sunburst Street. Local business owners have decided to petition the state Supreme Court to hear their case. “The county should evaluate the potential of the economic impact,” said Celeste Doyle, a member of the Joshua Tree Downtown Business Alliance. Members of the Joshua Tree community have been fighting against the construction of this Dollar General for over four years now. They say the store would cause blight and damage the downtown area’s unique character. A corporate spokesman contacted this week argued the store would be good for Joshua Tree. “We are very committed to providing things the community members need at low prices,” Dan MacDonald, senior director of corporate communications, said. In its lawsuit against San Bernardino County and store developer Dynamic Development, the Joshua Tree Downtown Business Alliance received a favorable ruling from the Superior Court of San Bernardino County, but Dynamic Development filed the appeal to the Fourth Appellate District, which ruled against the alliance. “We just wanted the San Bernardino County Board of Supervisors to acknowledge and consider the effects of the project,” said Doyle. Now, the Alliance has filed to the state Supreme Court. The California Supreme Court’s process is discretionary, so it could choose not to handle the case. If the California Supreme Court accepts the petition, the downtown alliance will file a more in-depth legal brief to the court. “We are asking the California Supreme Court to resolve the decision based on all of the previous information,” Doyle said. “The county approval is still in limbo,” she added. MacDonald said the location of the proposed Dollar General meets all of the company’s criteria for a successful store. The demographic is favorable, there is no real competitor and there is heavy traffic flow on Twentynine Palms Highway, where the store is proposed. He said the community may have some misconceptions about the store and its values but, assures the community that the company aims at providing affordable prices for common products. Doyle said the store will not benefit the community of Joshua Tree at all. She said it will just take profit from the community with no net benefit. MacDonald said. But, he estimated the new store will be up and running three to four months after the project has been approved. On Monday, August 22, 2016, the Joshua Tree Downtown Business Alliance (JTDBA) filed a Petition for Review with the California State Supreme Court, requesting that the Court overturn the adverse ruling recently issued by the 4th Appellate District in JTDBA vs. San Bernardino County/Dynamic Development, (a.k.a., Joshua Tree vs. Dollar General) (Case No. E062479). The Joshua Tree Community has steadfastly opposed the proposed Dollar General Store in our small, commercial, central district as inconsistent with, and undermining the County-adopted Joshua Tree Community and Economic Plans. The project would cause negative economic, traffic and neighborhood impacts the County has refused to address, as required under the California Environmental Quality Act (CEQA) and the County’s own Conditional Use Permit standards. The JTDBA successfully challenged the County’s approval of this project, winning an order from the Superior Court of San Bernardino County that required the County to evaluate the likely, negative impacts it would have on the economic stability and future of Joshua Tree. In essence, Joshua Tree is a small, rural community and the primary, most-used entrance to Joshua Tree National Park. The central, commercial district straddles the State Highway that runs through the center of town (Highway 62), is mostly only one block deep on either side of that road and not even two miles end to end. The restaurants, grocery and retail stores, art galleries, hotels and other shops are virtually all small, independent and locally owned and operated businesses. These businesses re-invest in their shops and the community, building the local economy as they draw more and more tourists and locals to experience our unique, friendly, small-town atmosphere. The presence of a corporate predator like Dollar General, with its misfit, cookie-cutter building crammed onto a lot too small to accommodate it at an intersection already overburdened and in the midst of the most densely-populated neighborhood in Joshua Tree would not only mar this district, but also undermine, even sabotage, what the Community has made of itself: A space and a place that is different from everyplace else, that embraces and reveres its natural environment, and welcomes and introduces visitors from all over the world to the Mojave Desert and Joshua Tree National Park. Just before the County Board of Supervisors voted to approve this thing, Staff told the Board that this project would be the tipping point for Joshua Tree . . . it would be the “camel’s nose under the tent” that leads to more corporate chains moving in, displacing and replacing locally-owned businesses, taking their profits out of the community instead of re-investing, and making Joshua Tree just another corporate, commercial strip: Generica. The Appellate Court reversed the lower court’s order, ruling that members of the Community had not provided adequate evidence to require that the County address the negative economic impacts the project would have. The Appellate Court ruling is contrary to CEQA standards, which require only that the Community make a “fair argument” that the project will lead to the identified harmful impacts, thus requiring the County to study and evaluate that likelihood. JTDBA has filed its Petition with the State Supreme Court requesting that it instruct the Appellate Court to follow the law and re-instate the lower court’s ruling.